Synopsis: An area of high pressure that has been with us for much of the week begins to slide toward the eastern part of our area tomorrow. The southern flow will usher in some warmer temperatures for our Friday. 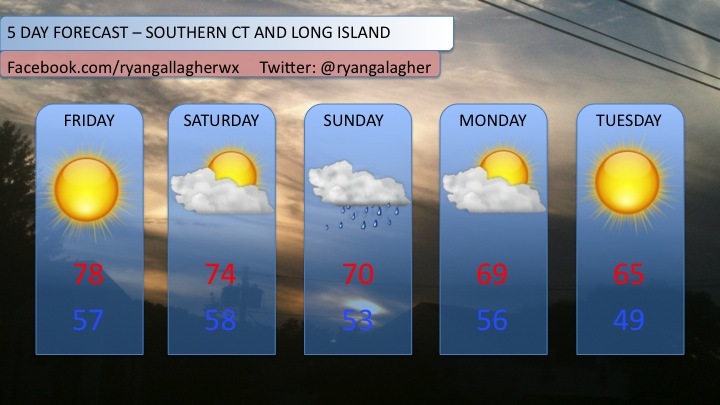 A cold front then approaches the area on Late Saturday into Sunday. Some showers or even a thunderstorm are possible with its passage. A coastal storm next week looks like it will be suppressed too far to the south for any impacts on the New England region, so sunny and dry conditions should prevail for the beginning of your workweek.